I have a chia pet in my tummy. At least that's what I imagine when I eat chia seeds. But I suppose they don't really produce long green sprouts when they're in my digestive system. Even though sometimes it feels that way. made with water is, well...watery. Unlike the Quick Cook Steel Cut Oats, the microwave was friendly to this hot cereal. Plus, I got the 900mg of Alpha-Linolenic Acid that my body craves! (I actually have no idea what that is. Perhaps a nutrition expert will enlighten us in the comment section below). 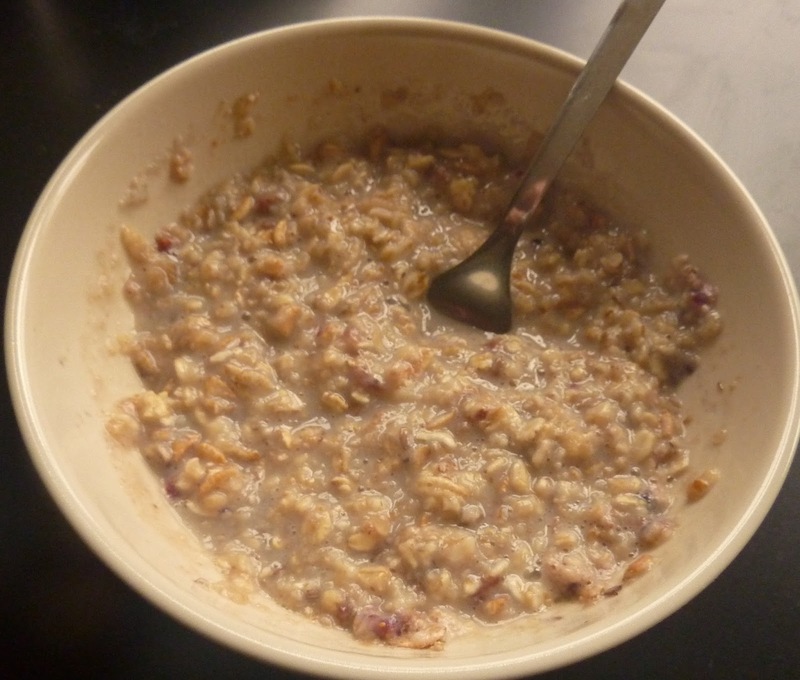 I was perfectly happy with the texture and taste of this oatmeal. 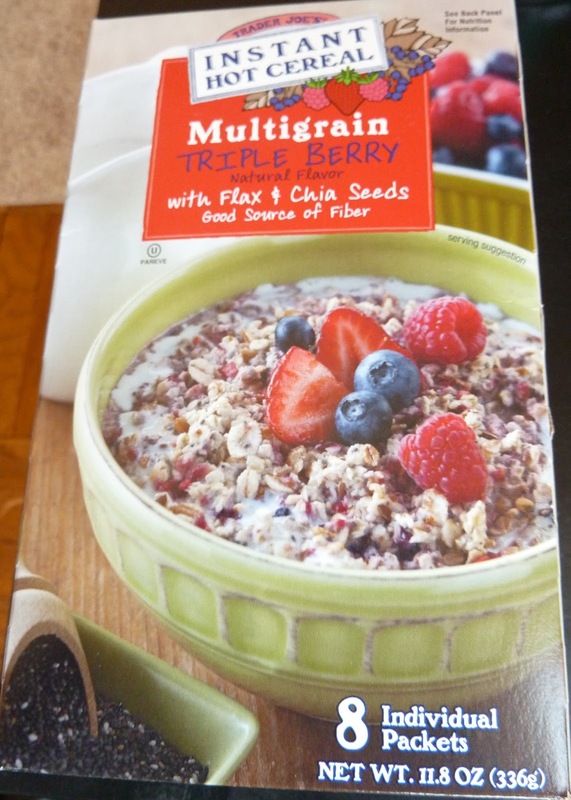 Surprisingly, I was satisfied with its berry content, too, even though in the past, I've found TJ's berry oatmeals wanting in that department. All of the dried berries were teensy-tiny, but there were plenty of them, and after a vigorous stirring session, they were adequately distributed throughout my bowl. And partially because of the berries, this product was perfectly sweet for me. There was no need to add sugar, and for those of you who've been reading for a while, you know I have a mad sweet tooth. The seeds blended seamlessly with the grains of oats and added a subtle but noticeable element of texture to the cereal's mushiness. Sonia's a huge fan of plain oatmeal. She eats it virtually everyday. In general, she doesn't like flavored oatmeals, but this was an exception to her rule...er, sort of. She couldn't muster quite as much enthusiasm as I could, but she generously gave this product a 3.5 star rating because it still tasted earthy and grainy like oatmeal should. I gave it 4 stars because it had all the wholesomeness of regular oatmeal, but it's significantly less boring. Perfect for these polar vortex mornings. Well there we go! With the url and everything. Thanks, Nikki! Don't think I've ever had the plain old multigrain oatmeal, but after your description of it, I think I'll steer clear of it! Mmmmmm, just tried this, and it is delicious. I took the hint about substituting the water, although I used nonfat milk myself. One thing I have to mention is that it's also an aromatherapy experience. The kitchen--nay, the whole house--smells wonderful. Full disclosure: I am not too excited by oatmeal and don't eat it often. I bought this because I wanted some fresh raspberries this week but was looking for something to put them on to make a more complete meal/snack. I decided their pretty photo of berries piled on this oatmeal was enough to get me to try it. I think the portion size is perfect, like you said. It's a small enough amount I don't get that weird bloated feeling that oats and other swelling type foods can cause, and enough that I feel I've eaten something. I actually thought this oatmeal was a little too sweet though, or maybe that was just in contrast to the raspberries I added, which were tart. I doubt I'll buy this oatmeal again but it'll be a nice companion for this week. Please bring back this oatmeal or the heart healthy blueberry,!!!!! !